"Highways of Ontario" to its motorist friends. a motoring aid from the motorist's point of view; one that will be dependable for its size and form. (2) service based upon advanced ideas. Supertest men are trained men , keen, courteous and intelligent. Integrity and reliability are their principles. They are taught to give Supertest Service in a cheerful, efficent, self-respecting fashion. the cornerstone upon which years of continual growth have been built. for you more of the real pleasure it should be. cover of the 40 page booklet, published in 1933, and shown on this page . 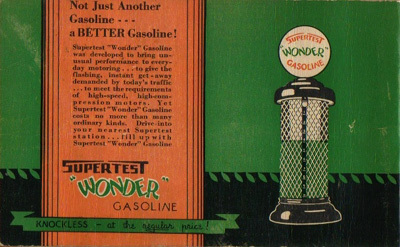 It represents Supertest's first road map , a relatively new form of advertising. 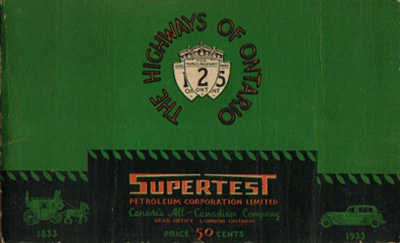 Cameron has a website dedicated to the history of The Kings Highways of Ontario. Please Sign my Guestbook----I want to hear from you! Gasolines and Globes | Daily Enarcogam | Whats New?